This shows self-reported political affiliation of a group of academic social and personality psychologists (this included some graduate students and post docs). 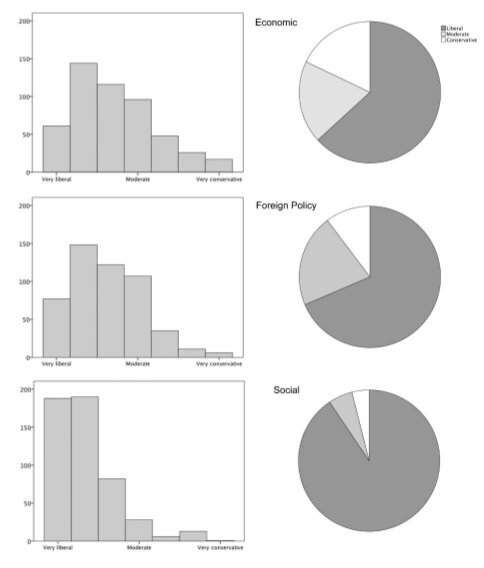 The graph is difficult to read on-screen, so download the original, from the peer-reviewed paper “Political Diversity in Social and Personality Psychology” forthcoming in Perspectives on Psychological Science by Yoel Inbar and Joris Lammers. Imagine our delight at finding more self-labeled moderates and conservatives than expected under Economics. Not every academic wants to take from them which have and then empower a government bureaucracy to dole back out a portion to support academic salaries. Celebrate this. And smile that the number of conservatives and moderates in Foreign Policy is not vanishingly small. Matching the freshness of the headline “Pope Catholic”, however, is the finding of the near absence of conservatives, and even moderates!, on Social questions. In many Departments across the land, when traditional mores are mentioned we hear only the sound of one man clapping. Or no man. Especially if that man claps too vigorously. For, can you imagine it?, academics preach tolerance and freedom, but they do not often practice it. The word you’re thinking of isn’t hypocrite, because the professor who professes “Tolerance!” has a theory which defines that word to mean something other than indicated in its dictionary entry. 1. If you were reviewing a research grant application that seemed to you to take a politically conservative perspective, do you think this would negatively influence your decision on the grant application? 2. If you were reviewing a paper that seemed to you to take a politically conservative perspective, do you think this would negatively influence your decision on the paper? 3. If you were organizing a symposium, do you think you would be reluctant to invite a colleague who is generally known to be politically quite conservative? 4. If two job candidates (with equal qualifications) were to apply for an opening in your department, and you knew that one was politically quite conservative, do you think you would be inclined to vote for the more liberal one? The proper answer to each, for those holding to academic freedom, open debate, intellectual honesty, and the like, is ‘No.’ We should expect, then, for the percentage saying no to be near 0, both for themselves and for their judgment of their colleagues. But before we come to those numbers, recall that this survey is self-reported, and that human beings lie on self-reported surveys (to the questioner and to themselves), especially on topics which are contentious. Plus, the participants are sociologists and psychologists who use surveys continuously and know well how difficult it is to hide the intentions of the survey. Thus, we might expect, given our wide experience on the reporting of contentious questions, Inbar & Lammers’s results to underestimate the true propensities. The more liberal respondents are, the more willing they are to discriminate. Another Who Knew? : “We also found that women were more liberal than men in all domains” (this was in both of two datasets they used). This is academic women, dear reader, a population differing in many respects from civilian women. [W]e find that the more liberal participants are, the more likely they are to react negatively to work Political diversity taking a conservative perspective. Obviously, quite obviously, these are “on average” results, with expected wide variability from institution to institution. Not much conservative discrimination, indeed probably its opposite, is expected at, say, Calvin College, where all professors must swear to the Nicene Creed. But lots and lots of discrimination is expected, and found, at places like Harvard—and there are many more Harvards than Calvins—where even a hint that one deviates (!) from the progressive line can send one packing. Buh bye, Larry. Even worse, one wrote “that (s)he once doubted that implicit measures really measure implicit racism, but felt too intimidated to openly ask that question.” In other words, don’t buck the consensus. If everybody uses a measure, it must therefore be right. I gave this warning to junior faculty and graduate students a month or so back. I repeat it again today. As my old father says, Never pass up an opportunity to keep your mouth shut. If you don’t, you’ll end up with too much time on your hands, forced to take to something as low as blogging. My initial reaction? Meh. But actually it’s quite disturbing that so many of these academics didn’t see anything wrong with that attitude, and were quite prepared to be open about it. Depressing; Stalin and Mao would be proud. Discrimination and hostile working environment in pro-non-discrimination and pro-non-hostile-environment academia? No! By definition, those can only exist outside of academia. It’s so much more satisfying to dictate behavior and attitudes to others than it is to apply the same to ourselves. Never pass up an opportunity to keep your mouth shut. If you donâ€™t, youâ€™ll end up with too much time on your hands, forced to take to something as low as blogging. In ancient times – my youth – liberal bias and lack of reliability was common knowledge. When meeting someone one quickly developed a sense of the new person’s political bent. If conservative minded you usually trusted them until they might be proven untrustworthy. If liberal, you mistrusted them until they were proven honorable. It was just easier that way. Read Zane Grey for further details. I always assumed it was because liberalism was a character defect, but that might just be me. It is true that at the moment academia is mainly liberal. But I you would lure yourself if you think that the result of this study would be different if it was mainly conservative. In fact, being liberal or conservative probably has very little to do with it. I mean the same phenomenon is seen in all science field and it is recently evident that in the field of climate change where there is a lot of obstrutionnism. I think it is more the theory put forward by Thomas Kuhn that is at play here. Next up: Research into “Socially Responsible Hiring Practices” to justify the discrepancy. After all, the children are our future. It’s irresponsible to let out-of-the-closet conservatives educate them. “Never pass up an opportunity to keep your mouth shut.” Excellent advice, which seems particularly applicable to me. Someday I shall give it a try. Meanwhile, perhaps this is a good time to reveal my new “Grand Unified Theory of Liberalism” (GUTL). I have been working on it for many years. Prior to my recent discovery of the GUTL, my previous working theory, which I called the “Standard Model of Liberalism”, or SMoL, was only able to explain Liberalism as an uncomfortable alliance of two disparate forces. The first force consists of “The Guilty”, the second force consists of “The Entitled”. “The Guilty” are a subset of “The Haves” who are uncomfortable in their haviness. Fundamentally they don’t believe they deserve what they have, believing themselves to be no more than simply the Winners of Life’s Lottery. Although they believe this very strongly, they lack the willpower to give up membership in this group, and rely on guilt as a convenient albeit ineffective salve to their unfortunate condition. “The Entitled” are a subset of “The Have-Nots” who are angry and unhappy in their havenotiness. They firmly believe their havenotiness is due to bad luck, or, more likely, targeted malice on the part of “The System” to deprive them of what they deserve. “The Entitled” are not a particularly industrious group, since their hard work in the past has not improved their lot in life, so further application of hard work would just be throwing good effort after bad. I found SMoL unsatisfying and inefficient. Sometimes I ran across individuals who were clearly Liberals, but SMoL didn’t help explain them. Hence the need for all the years of dedicated research I have applied to discovering GUTL. Although GUTL is quite young, so far it has served me well. For example, applying GUTL to the topic at hand, Rampant Liberalism in Acedemia, brings to mind that old saying “Those that can, do; those that can’t, teach”. While that saying oversimplifies to the point harshness, for those of us that attended a large university there’s no denying that the Professorial Staff was the antithesis of a hotbed of human competition. Egads, Milton. Spot on! And so easily explained it can be comprehended by everyone – except liberals, of course. Everybody knows that wealth, intelligence and good looks fall like rain from heaven on everybody equally. If you don’t have all thes things, then it’s somebody else’s fault, you’ve been cheated. You’re a victim and you deserve compensation. If you aren’t wealthy, then you have been screwed by Mitt Romney. If you aren’t good looking, then you’ve been screwed by Brad or Angelena, and if your IQ doesn’t exceed your body temperature, then you have been screwed by Dr. Briggs. Angelena sounds like fair compensation. No liberal or even progressive are against anyone getting rich. What we want is a level playing where everybody play according to the same rule. I’m glad for Mitt Romney that he has accumulated all this wealth. What I don’t like is that he accumulated it by another set of rule than the majority of the population. It is not normal that someone who work 40 hours of physic labor for a basic salary of about 50,000$ to pay more taxe in % than someone who mad $47 millions. Why the Romney should be able to deduce $77,000 in 2010 for a horse. There is no logic to that. There is no logic in getting tax cut when you cut job in your country to transfer them to Asia. There is no logic that fund managers at AIC got bonuses for a $1 billion dollars the same year that they almost sent the company into bankrupcy (if they hadn’t been saves by the government money(which Romney was asking for). At dinner one evening a few years ago, my very liberal hostess, a tenured faculty member in a graduate writing program at a major university, told us how she had blackballed a student’s admission application because he had revealed that he had worked for Bush II’s reelection campaign. Mom taught me that guests don’t call out their hosts, so I choked back what I wanted to say, but a “Really?” escaped, nevertheless. That brought a defiant glare and the further declaration that a) she felt absolutely justified in her action and b) that she would happily do it again. Leaving aside the fact that she was a crappy cook, I haven’t been back. Sylvain – Liberals don’t want equality of opportunity, they want equality of outcome. Furthermore, Romney isn’t exactly, “conservative,” although he is the more conservative of the pair. However, if he is playing by a different set of rules, that isn’t necessarily a liberal or conservative principle. So liberal aren’t against people being rich but they are more humanitarian in regards to minimal life condition, like education, health, minimum revenue, etc. If everyone should be able to have access to higher education it doesn’t means that everyone should go to universities. Just like everyone should be able to eat or have healthcare. When I work and I make a costly mistake, I will be glad to not lose my work. Yet in 2008, fund managers who created the worst economic crisis since the 1930s pocketed billions in bonuses. This is not the same rule than the rest of the population play with. They lost money yet they didn’t lose their jobs, suffer a cut in their pay. Meanwhile, millions lost their jobs and their houses. This is what we are fighting against. Just like in the early 1900s people were fighting against the thrust. Liberals cannot discriminate against conservatives on a large scale. To do that they would have to be able to identify conservatives and I think that’s beyond their ability.